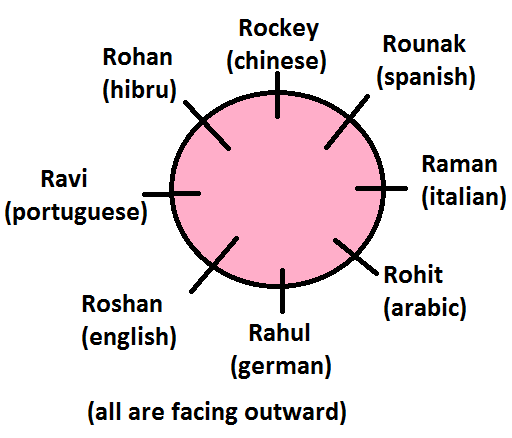 Rahul, Raman, Ravi, Rohan, Rohit, Roshan, Rounak and Rockey, eight students go to take admission in "International School of Language Learning" to learn different languages. Each of them likes a different language,i.e, German, Spanish, Portuguese, Chinese, Hibru, Arabic, Italian and English. But not necessarily in the same order. In the off time they are sitting around a circular table. All of them are facing outward from the centre. 6.Who sits opposite to Rahul ? 9.Who sits immediate left of the person who likes Italian ? 10.Who sits between the person who likes German and Ravi ?